The search industry lost a legend. Eric Ward link building pioneer and search industry expert who taught all of us died Monday, October 16. He was only 58 years old. They buried Eric and I just wanted to share some personal memories about the man who was a true www pioneer with outstanding morals and sense of purpose who generously helped everyone including me. Eric was just a superb human being! and if you read the information below and aren’t familiar with who he was you’ll begin to understand the enormous impact he had on the net. He was a mensch. Eric looked out for me aka the Educational CyberPlayGround, Inc. by looking out for another www pioneer named Gleason Sackmann the originator of Nethappenings Newsletter TM ©1989 and other mailing lists that he managed from Jan. 1993 to 2004. Eric knew Gleason’s work and used to post his own URLwire K12 news to Gleason’s Lists. Gleason was another mensch. He was an mailing list builder and retired in 2004. At that time he asked me to take over the database and his mailing Lists. I talked with Eric about this whole transition and he was very supportive and offered his encouragement and advice. He even gave the nethappenings.com domain to me – having thought to buy it a long time before Gleason retired in order to protect it – for Gleason’s sake. Talk about foresight, and generosity of spirit!! Ever heard of anyone doing that for someone else? No you haven’t. That is the kind of man Eric was – He did that. In 1994, we did not include wireless in the prescription for the infrastructure. Most of the work that I know about was done by Gleason Sackman who wired the K12 Schools in North Dakota and Dave Hughes (Crystal Radio Sets / Ham Radios) , who was supported by the National Science Foundation and was started and finished after this initial document was done. And the School systems applying for the Erate, may need the ability to use wireless for a variety of reasons. 1998 awarded SIG/Tel Educational Telecomputing Outstanding Service Award. Began listening to shortwave broadcasts in 1956. Years and years ago Eric and I spoke about the way things were going after he refused to allow google to buy him out. He questioned that decision, and it worried him. I’m glad he didn’t sell out. He was the one who always preached to site developers to link to what is best for people NOT for a machine and certainly not just for the sake of profit! Remember the google statement “Do No Evil”? Turns out it was Eric who had principles. He didn’t want google to be evil or have any racist machine algo be in control of what Americans read, learned, and then believed just for (insert name here) profit! Eric Ward was THE example of a straight up guy and what we wish SEA search engine behavior was about. All the lawyers and lobbyists the SE’s money have down in Washington trying to worm they traitorous ways out of the trouble they have caused Americans won’t change how their racist lousy algos distorted the election and promoted fake news. Sergi, Jack, Zuck et al all have the data that shows what happened! They have been active participants in Moscow’s information warfare against the United States. We need to have laws to reign them in, tax them, control what are allowed to accept for advertising money, force them to turn over the election data they have right now and get judges to jail them. A free internet doesn’t mean free to make more money being evil. There are consequences in this world for that. Eric Ward a www pioneer was a man among men, the man who wouldn’t sell out and should have been in charge of the ways search engines at #alphabet #facebook #google #twitter #youtube #linkedin etal conducted themselves. Eric’s passing is heart breaking for all of us who have been building websites for over 25 years under the tyrannical thumb of machines owned by Sergi Brinn et al. since 1998. RIP Eric Ward, he was a true man of the net and in all ways that he conducted his business and his life. I’m proud to have known him and shared time with him on this journey. Online since 1991 Educational CyberPlayGround® edu-cyberpg.com launched on July 9, 1998 recorded by the wayback machine in 1999. ©The Hot list of Schools online was the first list of the K12 schools URL’s made in the United States. It started in 1993. Folks sent their URL info to Gleason who announced it on his NetHappenings mailing list the first and oldest K-12 Mailing list in the world started in 1989. I launched the Hotlist database on the Educational CyberPlayGround July 9, 1998. This was the first one in the United States up online. It is a public folklore project and K12 Internet History. giving everyone the ability to search and find a school’s website or if they even had one! Since then folks have kept submitting their school info and urls to me. And believe it or not every submission was checked for accuracy by me. Announcing a New Web Source editors, writers, and reporters can contact me.It’s been 20 years and we needed to get things up to speed so and the project has morphed again using open source Linux and Drupal. We thought it best to migrate everything to a new home and the first Hot List of Schools online list has now become the K12Playground.com ©The Hot list of Schools online but there is still a lot left to do. I think he would have been the first one I told about this project when I was ready… but it’s too late. With his Library and Information Systems / White hat background, I know he would have loved to know this nethappening is still alive! Ads are evading new Facebook rules by misspelling them. ” Facebook hasn’t figured out something that spammers have been doing for the last two decades? Zuuuckerberg is supposed to be smart right? He’s got to know what everybody else already knows– right? BlTC0lN with L and Zeros is Hilarious! Zuckerberg doesn’t need “Artificial” Intelligence. He needs Human Intelligence. He needs to hire people to look for the ads to know what is bogus. Oh wait !! we remember… he had people doing that and it ruined everything. Not only did he have to pay people but they caught these things which ruined Zuckerberg’s money. He is paid by these same advertisers the people were catching. So …. there is no kind of intelligence needed because none of that will fix greed! Facebook is going to die. Algo’s and people have never solved the problem of GREED. 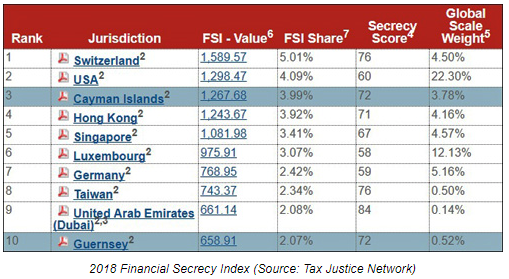 The Financial Secrecy Index for 2018 names the United States the 2nd worst country for facilitating financial secrecy and illicit money flows, just behind Switzerland. Chairman of the Securities and Exchange Commission, Jay Clayton has tens of millions of dollars in family net worth tied to a Delaware company specializing in providing secrecy to corporate entities. The International Banking Facility mechanism introduced in 1981 “allowed banks in the U.S.A., which had previously needed to go offshore (particularly to London) to get around domestic financial regulations, to keep a separate set of books that effectively allowed them to obtain these exemptions while remaining at home. The Tax Justice Network shows the problems go far beyond tax. In providing secrecy, the offshore world corrupts and distorts markets and investments, shaping them in ways that have nothing to do with efficiency. Delaware, Wyoming and Nevada are the leaders in offshore secret incorporations. I remember when the CEO of Diebold sent Bush a letter in 2003 saying that he was committed to “helping Ohio deliver its electoral votes to the President.” These machines have been easy to hack for 20 years. We need paper ballots. These machines have been easy to hack for 20 years.